This is something which we all love. The essence of cashew in each bite is to die for. 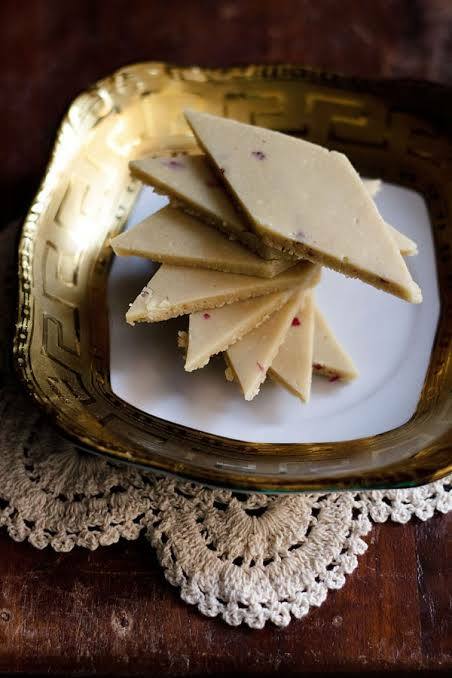 If you have a sweet tooth, Kaju Katli should definitely be one of your favourites. First, powder 1 cup of kaju and keep aside. Then, heat a pan and add 1/2 cup sugar with 5-6 tablespoons of water. Heat this mixture on low flame. Meanwhile, grease a tray with butter and put aside. After sugar is dissolved, add cashew powder to the mixture and keep stirring. Let the mixture get thick. Cook it for nearly 7-8 minutes. 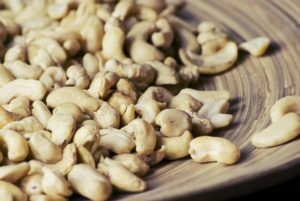 Turn off the flame and place the whole cashew mixture on a plate. As soon as it gets easy to handle, add some rose and ghee. Then, knead the mixture well and flatten it. Put it over the greased tray and cover with butter paper. Using a rolling pin, make it flat upto 3-5mm thickness approx. 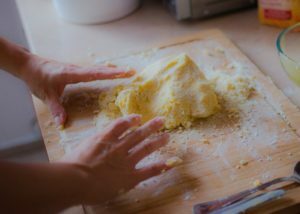 Remove the butter paper and let it cool. When it is completely cooled down, cut diamond shapes kaju katli from it. Serve with some chopped nuts or store in an air tight container. This diwali recipe is a must try! Gulab Jamun is again one favourite sweet recipes in India. No occasion is complete without these khoya balls dipped in sugar syrup. During Diwali, every household makes this in their home. First, mash a cup of khoya or evaporated milk in a bowl nicely. Then, add 3/4 cup of paneer, 2 tablespoons of semolina and 3 tablespoons on maida to it. Add some cardamom powder and mix it well. Add some milk, as required and form a smooth dough. Cover it and keep aside for 30-40 minutes. Then, make small balls from it. Dissolve 250g of sugar in 1 cup of water and heat it. Let the mixture become sticky. Turn off the flame as it becomes a thread consistency. Then, add 1 tablespoon of rose water to it and stir gently. Keep aside for later use. If the syrup crystallizes, then add some water and heat it again. Heat some oil in a pan and add the prepared balls to it. Fry them on both sides evenly. Make sure they turn brown in color as a whole. After frying, put them on tissue paper to remove excess oil. 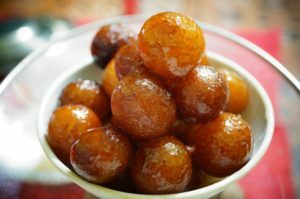 Then, place these hot gulab jamuns in sugar syrup and let them soak it. 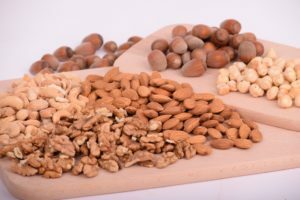 After a while, garnish them with some nuts and serve. Your family will surely enjoy this Diwali recipe. This Diwali recipe is very traditional. It’s not very famous but is sure very tasty. 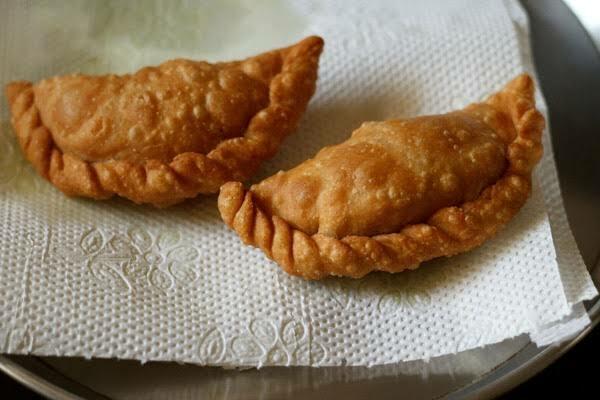 It’s basically an Indian pastry filled with sweet filling. It’s mostly cooked in the northern part of India. So, if you haven’t tried it yet, cook this following the instructions below. Add 1 cup whole wheat flour, 1 cup all purpose flour and 1/4 teaspoon salt in a bowl. Then, add 2 tablespoons of heated ghee into it. Rub this mixture in your fingers to get crumbled texture. Next, add some water and form a firm dough. Cover it with a moist cloth and keep aside for 1/2 an hour. Crumble a cup of khoya and chop 1/3 cup of dry fruits ( of your choice). Heat 1/2 tablespoon of ghee in a pan and khoya to it. Stir nicely on low flame. Cook it till it gathers itself well. Turn off the heat and let it cool. Once it is cool, add 1/3 cup powdered sugar, chopped dry fruits and a pinch of cardamom powder to it. Mix it well and check the taste. Keep aside for later use. First, cut small balls out of the dough. Then, make small circles of it using a rolling pin. Apply water over the edges, and place the stuffing on one side. Then, bring together both edges and join them. This will give them a half moon shape. Seal the ends well to avoid leaking of stuffing. Fry in oil, evenly on both sides and serve hot. You can also bake them to keep it more healthy. 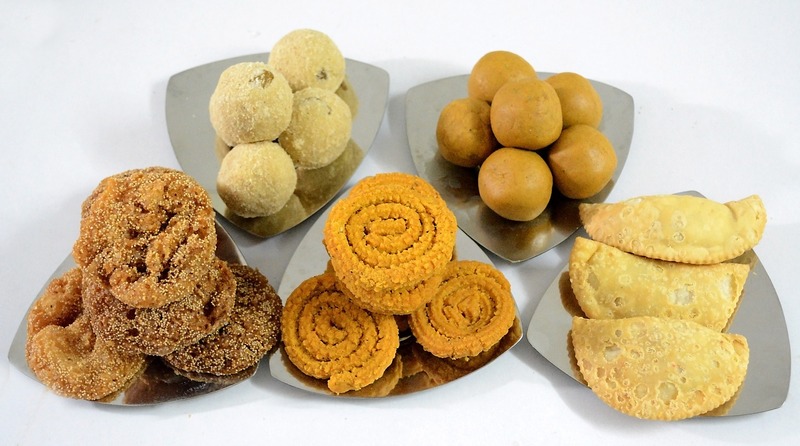 This yummy Indian pastry will surely win your heart. Try out these amazing Diwali recipe of sweets and let me know your experience in the comment section.